The use of bio ethanol fuels (especially in bio ethanol fuel fireplaces) is all the rage lately among supporters of green energy living. In today’s post we will walk through the basics for this type of biofuel and how you can use it. You are probably familiar with ethanol, as a component of many alcoholic beverages and also a common way to start fires or use as fuel (gasoline replacement). Ethanol is a type of biologically-produced alcohol in a very refined form. The fact that it is biologically-derived means that ethanol is obtained through the fermentation of sugars in natural produce (wheat, corn, beets and so on). In a way, ethanol is just the super-refined (and more concentrated) version of moonshine and other really strong beverages. Today, ethanol is considered one of the most convenient sources of bio energy, with the only reluctance towards its wide spread use being the fact that it’s not entirely sustainable, but only quasi-sustainable. The lack of complete sustainability comes from the fact that ethanol production requires a serious input of heat, and many times this heat comes from a questionable source, like the burning of unsustainable gas. Ethanol production also requires the main ingredient of agricultural products, of course, but this is a good thing from the green living point of view. If the required produce doesn’t come from tainted agricultural practices, it can actually cut down on a lot of waste (mainly fruit and potato waste). 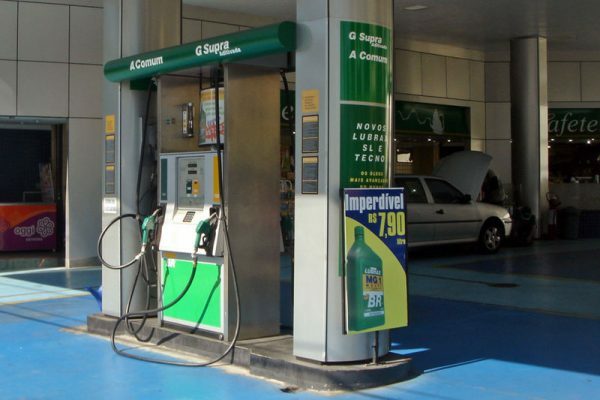 Double pump (one with gas and one with ethanol fuel) at a gasoline station in Sao Paulo, Brazil. This is why using ethanol as an energy source is one of the most innovative ways of ensuring more green energy into an area’s overall consumption levels. It is one of the most common types of biofuels used worldwide. The country where ethanol is used the most is currently Brazil. Now comes the interesting distinction between regular ethanol and bio ethanol fuel: in ordered to be labeled as bio, the ethanol fuel needs to be obtained not only from bio agricultural waste, but also by a more environmentally-friendly heat source. As long as these 2 conditions are fulfilled, the ethanol fuel (which is already quasi-bio and quasi-sustainable in itself) can be officially considered a green fuel. A fine way to incorporate an ethanol fireplace into a modern and edgy interior design setting. Bio ethanol fireplace fuel is popular not only for its lower impact on the environment, but also for its high convenience. Ethanol fireplaces are very easy to use, especially for new homes or for apartment without a flue, since the fireplace itself doesn’t require a chimney or flues. The heat output of such a fireplace is slightly less strong than those of gas fireplaces or electric fireplaces, and it also requires a few precautions. Even though there is no chimney required and you don’t really need to worry about starting a fire in your home, you still need to be careful to avoid monoxide carbon poisoning. This means that you should never fall asleep with an ethanol-based fire still running and the windows closed. On the other hand, ethanol is preferable to any ethanol-free gasoline due to its higher octane rating: this means that the use of ethanol allows an increase in the compression ratio of the car’s engine, which leads in turn to an increased thermal efficiency. Unfortunately, in many countries bio ethanol fuel is only available for sale if you want to use it for ethanol fireplaces. For car use, you need a change in the industry itself, or at least in the politics of a few gas stations that can invest in the required infrastructure. If you can’t get ethanol fuel from a gas station, you cannot use it safely for your car’s fueling needs by yourself, so don’t even think about it. You can find a list of gas stations which sell ethanol fuel in the United States here. These are the most common questions users interested in bio ethanol fuel usually have about it. a) Where Can I Buy Bio Ethanol Fuel? As long as you’re not trying to buy bio ethanol fuel in order to put it in your car’s reservoir for your fuel needs, it is fairly easy to find ethanol (methylated spirits) from various sources. Most hypermarkets and chain stores which sell home supplies have stocks of bio ethanol fuel bottles. Labeled as ethanol or bio ethanol, the labels on the bottles usually state pretty clearly that the contents is meant to be used as biofuel for ethanol-based fireplaces only. If you’re wondering where to buy bio ethanol fuel conveniently, here are some big store names that sell ethanol: Tesco, Walmart, and Home Depot. Still, it’s much easier to find ethanol online, from places such as eBay, Amazon and various ethanol-specialized retailers. b) What Are the Expected Prices for Bio Ethanol Fuel? Of course, any owner (or would-be owner) of an ethanol fireplace wants to find a good source for the cheapest bio ethanol fuel on the market. Still, you should note that the source should be trustworthy and this is more important than the price. There are plenty of places where you can get cheap bio ethanol fuel online and delivered to your door in the next few days; the prices are usually low enough from all suppliers, so you don’t really need to go for the cheapest you can find. As a price estimate, you can expect to pay about $30.00 for 3 quarts of bio ethanol fuel, and about $99.00 for 24 quarts (on eBay). c) Should I Switch My Heating to One Based on Ethanol? If you’d like to own a couple of ethanol-based fireplaces for decorative purposes, then it’s a perfectly fine idea, both aesthetically and heat-wise. The flames of ethanol fires burn cleaner and brighter than traditional gas or log-based fires, and there is also no smoke or unpleasant smell associated with them. For these reasons and more, out advice is to go for it. However, it would probably be difficult to switch the heating of your entire home or building to ethanol fireplace heating, so this cannot be your sole source of thermal energy. No ethanol fire can be left unsupervised, and the installation of several such fireplaces in different rooms of your home would therefore be difficult. It’s a better idea to just stick to your living room, but the fact that you replace at least part of your heating with an ethanol-based one is still a great move forward for the environment (and your interior design as well).